The Subaru Legacy Concept will make its world premiere at the 2013 Los Angeles Motor Show, hinting at the design direction for an all-new version of Subaru's flagship Legacy model. 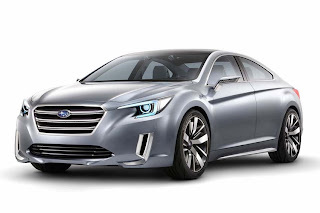 the production Legacy has been praised the world over for its safety, dependability and driving performance, delivered by Subaru's hallmark Boxer engines and Symmetrical all-wheel drive system. The design of the new Legacy Concept develops the model’s image as a dynamic, secure and practical saloon car. Its dynamic front-end features the distinctive hexagonal grille first seen on the Subaru Viziv Concept vehicle at the 2013 Geneva Motor Show. While maintaining a comfortable and practical interior, the Legacy Concept also features a sleek side profile and coupe-like roof. Large wheels and bold wheel arches lend the car an air of stability, entirely appropriate for a car equipped with Subaru's sure-footed all-wheel drive system. The Legacy Concept's interior is one of the most high-tech ever seen in a Subaru model, with a smartphone-style centre console and instrument panel that extends from the front to the rear of the cabin. With ample seating for four passengers and a sporty, driver-focused cockpit layout, the interior has a dynamic and solid design, with brown leather upholstery and blue accents throughout. The concept also features the latest version of Subaru's advanced driver assist system, 'EyeSight', which monitors the road ahead and recognises potentially dangerous driving situations.